Jumpin’ creepers! A mole cricket: the European Mole Cricket Gryllotalpa gryllotalpa? iNaturalist seems to think so. Found on the NY/CT border recently. A crazy blog fundraising idea. Another crazy idea: Brooklyn Bird Club lecture tonight on stopping the slaughter of birds crossing the Mediterranean. Maybe this is what I hear next to me at nights and early morning. I love the sound. Not like a chirpy cricket, but almost a buzz to it. I am more familiar with the traditional cricket. I listened, but that is not the sound I hear. Hmm, mystery not solved. Not every crickety singer is listed in these things, unfortunately. I saw one at Ward Pound Ridge Reservation some years ago. My group thought that it might be a larval form of something (for me, it holds the record of least attractive insect ever), so we took pictures and I sent them to a naturalist friend, who IDed it for me. I would never have guessed it was a cricket. My friend told me that mole crickets often inhabited damp basements, but I haven’t seen that in the articles I’ve read about them. This one was under a log, where they are regularly found on this site. Yeah, they take a bit of getting used to, sight-wise. 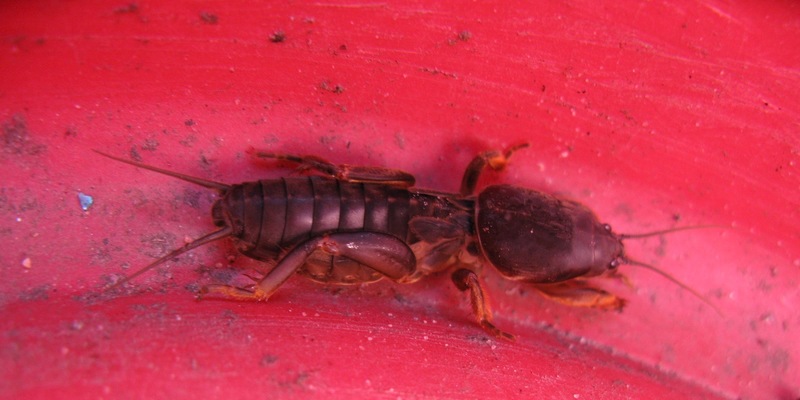 Oh, when I checked my pictures, I found that mine was a European mole cricket.